Strawberry and Rhubarb are a classic combination often used in sweet dishes like pies. Here is takes on a more savory tone but still brightens up and adds color to a dish featuring another spring favorite, white asparagus. With the rhubarb season being pretty short, I usually make a large batch of the compote and freeze it for later use. 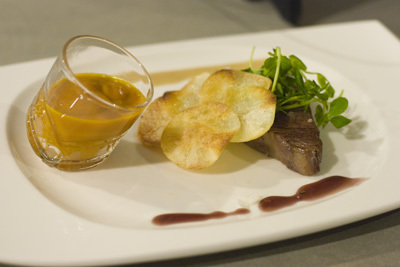 While the process looks very long, many things can be done in parallel while ingredients steep and cook. This dish is adapted from a recipe by the Voltaggio brothers’ cookbook VOLT ink..
Cut the bottom 2 inches off the asparagus spears and reserve. Cut the top 2 inches of the asparagus spears and reserve. 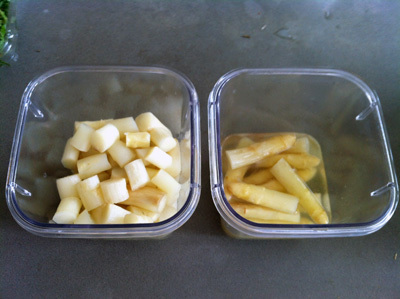 Cut the remaining asparagus spears into ¼ inch pieces and reserve. Add the water, bay leaf, thyme, lemon zest and 12g of the sugar. Bring to a simmer and then immediately remove from heat. 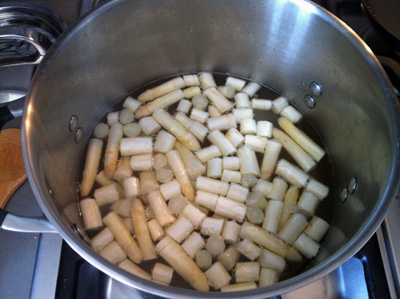 Add the reserved bottoms of the asparagus spears, cover and let steep for 20 minutes to make an asparagus stock. Strain the stock back into the original pot discarding the solids. Add the asparagus tips and pieces, the remaining 12g of sugar, and the salt. Bring to a simmer and let cook until the asparagus is tender (about 20 min). Remove the asparagus tips from the pot and reserve in a container with just enough stock to cover until ready for final serving preparations. 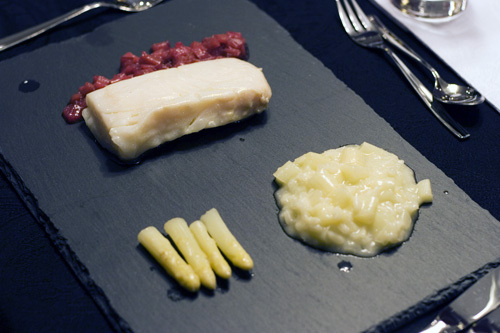 Remove the remaining asparagus pieces and refrigerate until the asparagus risotto is nearly finished. Strain the stock using a fine mesh sieve. If making the asparagus risotto immediately, heat to just below a simmer. Otherwise, cool completely and refrigerate until making the risotto. 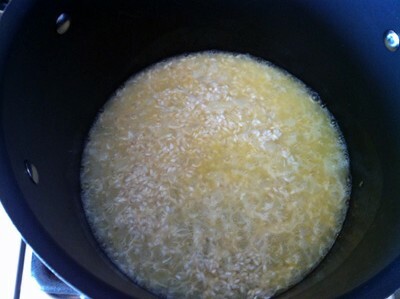 In a small pot, combine the water, Riesling, sugar, and salt over medium high heat and bring to a simmer. Add the strawberries and bring the liquid back to a simmer. Remove from heat, cover and let steep for 20 minutes. 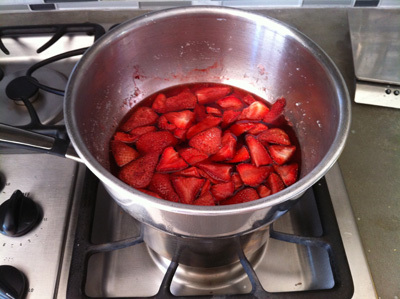 Strain the syrup back into the same pot, discarding the strawberries. Bring back to a simmer and cook until reduced to 60g (about ¼ cup). If you are making the rhubarb compote immediately leave the syrup in the pot. Otherwise it can be cooled and refrigerated for 3 days. In a small pot, combine the strawberry syrup (from above) and the verjus. Bring to a simmer and cook until reduced by half (about 10 min). 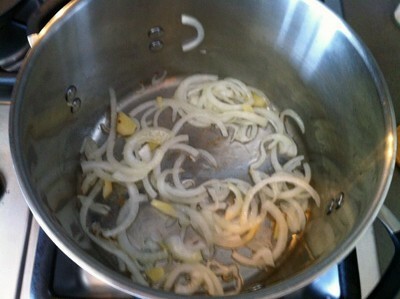 In a separate dry pan, cook the onion over low heat until it is caramelized (about 10 min). Fold in the strawberry mixture, cinnamon, and coriander. 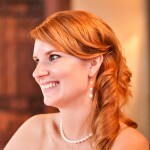 Use immediately or cool and store in the refrigerator until final preparations for up to 5 days. In another pot melt 28g of the butter and the olive oil over medium high heat. Add the asparagus stock one or two ladles full at a time. 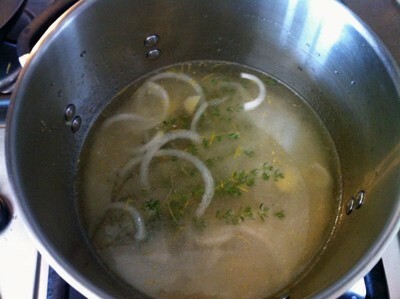 Stir after each addition and cook stirring frequently until the liquid is almost evaporated before adding another ladle. 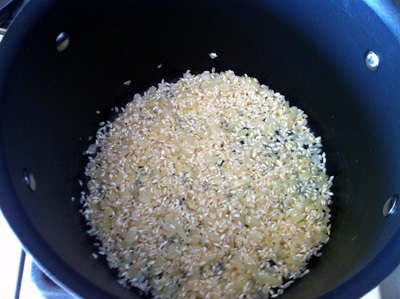 Adjust the heat to keep the risotto at a low simmer and keep adding the ladles of stock until it is all absorbed. Add the cheese and the remaining butter and stir to incorporate thoroughly. Add the remaining asparagus pieces and cook until just warmed through. Keep warm until ready to plate. 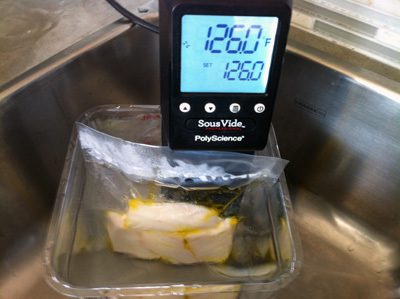 Removed the fish from the brine and pat dry. Discard the brine. 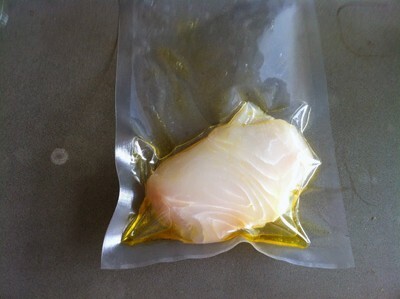 Vacuum seal the fish with the olive oil in individual bags. 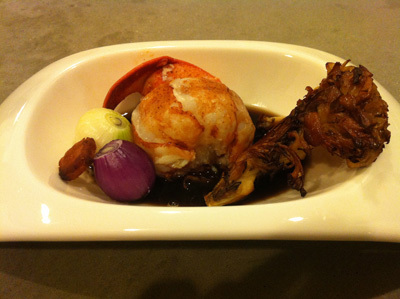 This will help with service later as the fish becomes very tender and liable to fall apart. Cook in the water bath for 15 minutes. Heat the rhubarb compote in a small pot until warmed through. 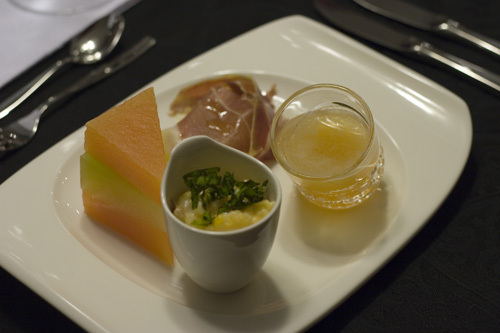 To serve, put a spoonful of the rhubarb compote along the left side of the plate. Remove the fish from the vacuum bag and place halfway on top of the compote. Put a spoonful of the risotto on the top right corner of the plate. Line up the asparagus tips facing the same direction below the risotto.